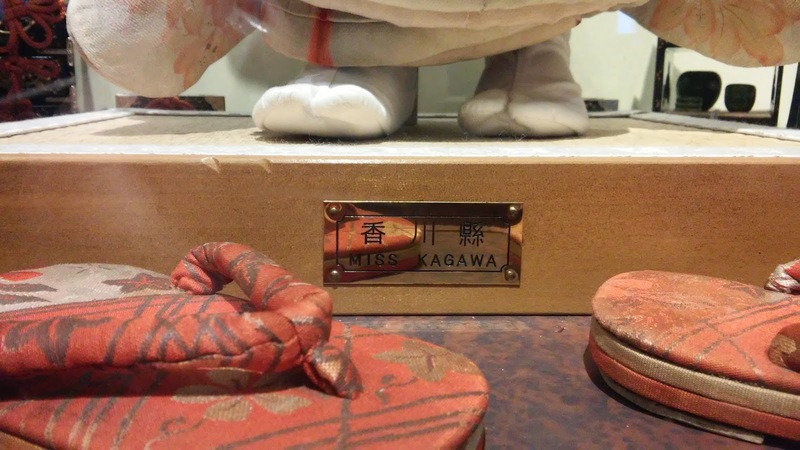 Jared Unzipped: Miss Kagawa - ミス·香川. In celebration of my birthday this week, I was lucky enough to visit the North Carolina Museum of Natural Sciences today. Oh, what a wonderful place it was. Full of exquisite exhibits and interactive displays - it really was a treat. Thanks for the trip, Crystal! While there, I happened upon this unique display. This doll is known as Miss Kagawa. It was one of fifty-eight friendship dolls given to the People of the United States by Japan in 1927 and 1928. The dolls, also known as Torei Ningyo (Ambassador Dolls) went to different locations around the country. 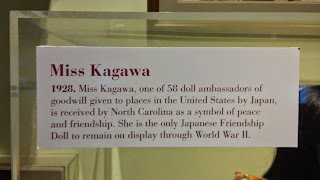 Miss Kagawa came to the state of North Carolina. 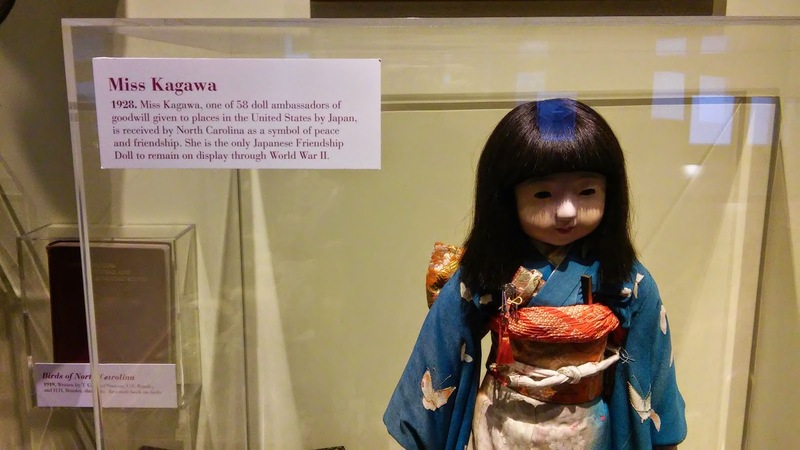 Japanese Friendship Dolls were a token of peace and gratitude given by the citizens of Japan to ease international tensions and foster amicable relationships. "The Japanese made an insane attack upon the American Territory of Hawaii on December 7, 1941. With a grim determination we now are committed to stop for all time Japanese aggression. This has no bloodthirsty implications to destroy peoples as such. We still believe in peace and good-will, to live and let live. Men, women, and children of Japan have this good-will but they have now been dominated by ruthless leaders. Proof of such latent good-will are the Friendship Doll Exhibits exchanged between children of the United States and Japan during 1926 and 1927 and shown as here in Museums in both countries." 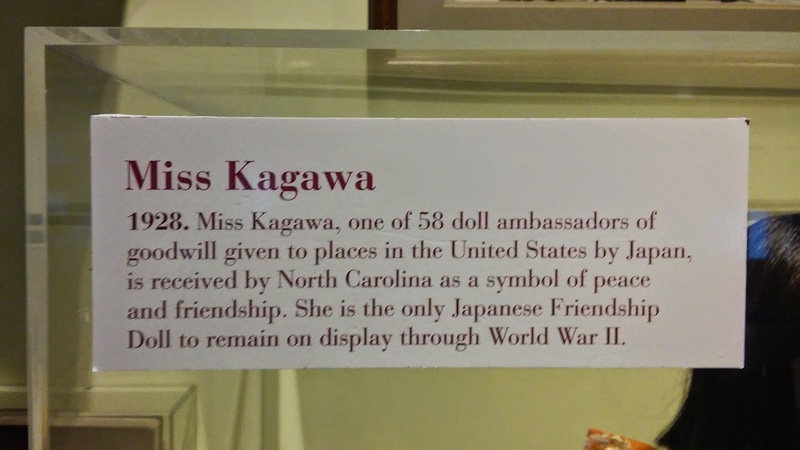 It seems that out of all the locations in the United States that hosted one of the Japanese Friendship Dolls, only the administration of the North Carolina Museum of Natural Sciences had the foresight to realize one key point. The People of Japan had no quarrel with Americans during World War II. Their intent to promote friendship was just as true then as when the dolls were originally gifted. War is the action of aggressive governments, not good-natured citizens. Wars are fought between governments, not people. Miss Kagawa stands as a symbol of eternal hope in the face of despair. 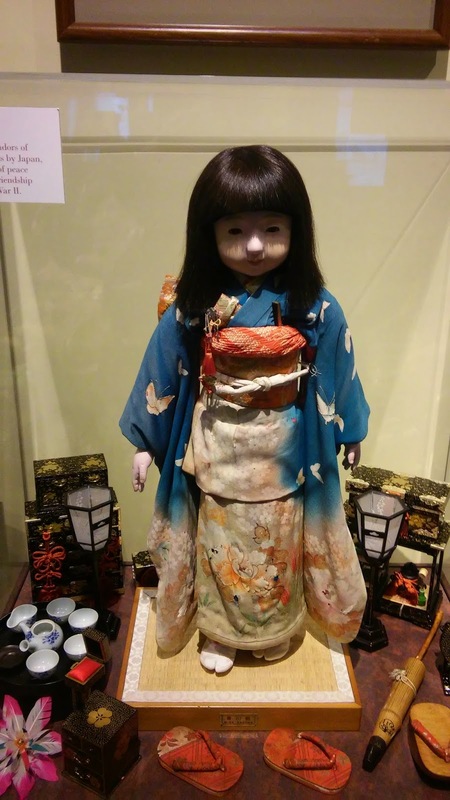 After World War II, the Japanese Friendship Dolls that survived took a long time to return to the public eye. Yet, Miss Kagawa stood vigilant through it all, on display for everyone to see. In 1998, Miss Kagawa made a homecoming trip to Kagawa Prefecture in Japan. She spent a year there, where some restoration work was performed. Many commemorative ceremonies were also held in honor of Miss Kagawa, colloquially referred to as the "US-Japan Peace Envoy". 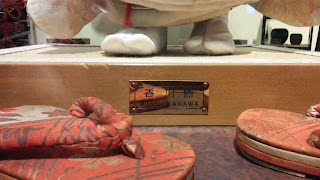 I highly suggest that you see Miss Kagawa for yourself if you have the opportunity!